Andrea Ridilla holds a Master of Music and a Bachelor of Music degree from The Juilliard School and a Bachelor of Music degree from the Oberlin Conservatory of Music. She is Principal Oboe of the Classical Music Festival in Eisendstadt, Austria and was Principal Oboe of the Festival International Echternach Orchestra in Luxembourg from 1991-2007. She is also Principal Oboe of the Middletown Symphony. In her CD L’Amore Italiano, released on the Kleos label of Helicon Records, Andrea is featured soloist with the Sofia Philharmonic in Bulgaria under conductor Ricardo Averbach. With Udo Heng of Reeds ‘n Stuff in Annaberg, Germany, she is co-designer of the Ridilla-Heng gouging machine, which is patented in the United States. In April 2012, Andrea was guest artist at the Moscow Conservatory of Music and the St. Petersburg Conservatory of Music performing, giving oboe masterclasses, and reedmaking masterclasses. In March 2012, she was the guest oboe professor at the 3rd Encuentro of the Asociación de Doble Caña of Seville, Spain. In 2010, she appeared as soloist at the Musica no Museu Festival in Rio de Janeiro, Brazil as well as concerto soloist with the Quito Orquesta da Camera in Ecuador. She has also been concerto soloist with the Guayaquil Symphony Orchestra in Ecuador, the Festival Echternach in Luxembourg, the Moselle Music Festival in Germany, the Classical Music Festival Orchestra in Austria, the Westmoreland Symphony, and the Ashland Symphony. She has been a guest performer in several concerts with Camerata Pacifica in Santa Barbara, California. She has performed solo recitals throughout Italy: in Rome, Florence, Turin, and Pisa. She won the top prize for winds at the Munich Preliminaries of the Torneo Internazionale di Musica Competition, and was one of six international soloists invited to Rome in May 1998. She was awarded fellowships to Tanglewood, Yale at Norfolk, and the Music Academy of the West. 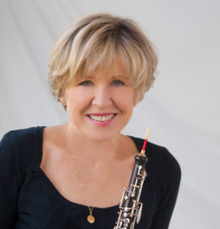 Prior to her appointment at Miami University, she served as principal oboe with the Las Vegas Symphony, Rhode Island Philharmonic, and the National Orchestra of New York. She has been on the faculties of the University of Nevada, Las Vegas, and the New York State Summer School for the Arts at Saratoga. Her oboe teachers have included Robert and Sara Lambert Bloom, Louis Rosenblatt, Allan Vogel and James Caldwell. She studied reedmaking and gouging with Joseph Robinson, and took perfection classes with Hansjörg Schellenberger, and Maurice Bourgue. Her local high school students have been chosen by competitive audition into the Cincinnati Youth Symphony, Dayton Youth Symphony, District and Regional Bands and Orchestras, and Ohio All-State.